Brace yourselves, chicken and waffles fans. The classic combination is now available for a limited time as a sweet-and-savory dessert. 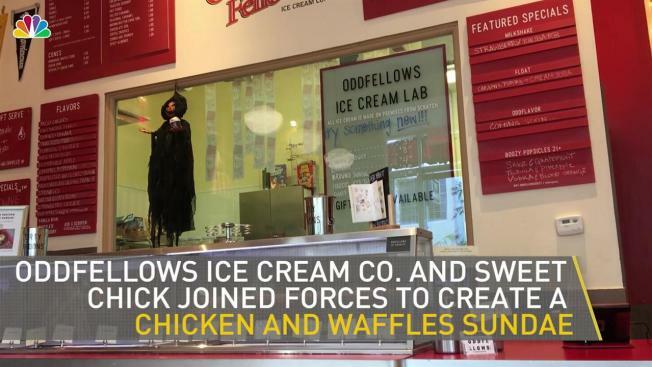 Sweet Chick and OddFellows Ice Cream Co. have joined forces to create the Chix n’ Waffles Ice Cream Sundae. The treat is exclusive to the month of November as a part of OddFellows' “Passport Program”, featuring original desserts from different continents each month. This particular sundae pays homage to North America. The base is one of Sweet Chick’s waffles topped with OddFellows' buttermilk apple ice cream. It’s then topped with butterscotch sauce, powdered sugar and salted chicken skin crispies. The Chix N’ Waffles Ice Cream Sundae can be purchased for $9 at Sweet Chick in Williamsburg or any OddFellows location.